Getting aggressive early with livestock-killing wolves works better than gradually ratcheting up the response, according to research published last November by Montana Fish, Wildlife and Parks biologist Liz Bradley. Ten years of data looking at how wolf-pack size and distribution predict livestock attacks has helped wolf managers improve their tools for protecting cattle and sheep. Livestock deaths have shown a steady decline in the past several years. In a cursory view, Bradley’s results seem obvious: Remove a wolf pack, remove a livestock problem. Rob Wielgus runs the Large Carnivore Lab at Washington State University. He worked on similar studies that showed killing wolves can lead to more livestock losses. But he said the difference depends on the size of landscape you look at. You also risk new conflicts. States like Montana and Idaho must keep their wolf populations above certain thresholds or lose their local authority to the federal government. 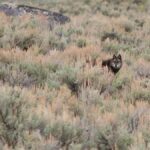 Places with new wolf populations, such as Washington, must show a measured response if they also want local control of what’s still a threatened or endangered species there. Killing wolves that kill livestock defines reactionary management. Bradley, Wielgus and most other wolf researchers agree getting ahead of the problem is both cheaper and more effective. Wielgus said a two-year experiment with non-lethal wolf controls in Washington bears that out. The procedures include posting cowboys around cows and shepherds around sheep, removing carcasses promptly, placing fladry and portable fencing around pastures and related tactics. Washington has paid for the ranchers’ extra labor through grants funded by a license-plate fund and contributions from state and private agencies. Since gray wolves were reintroduced in the Rocky Mountains in 1995, and removed from federal Endangered Species Act protection in 2011, their relationship with human neighbors has evolved. Mitchell and his team members have been refining ways to count wolves in the wild without the expensive assistance of a large radio-collar program. That’s essential because wolf population numbers form the measuring stick gauging how well management tools work. The 2015 wolf census won’t be ready until March. The 2014 report pegged Montana’s wolf population at 554, down from 627 in 2013. That included 134 packs of two or more wolves, 34 of which qualified as breeding pairs. In 2014, federal Wildlife Services officials reported 42 livestock losses to wolves, compared to 78 in 2013. Government hunters or private citizens killed 57 wolves in 2014 in response to livestock incidents. Hunters and trappers took 94 wolves during the 2013-14 season, and 119 during the 2014-15 season. It also may mean wolves are becoming a two-sided management challenge. There’s one bag of tools to work with wolves and livestock. A different bag may be necessary to work with wolves and wildlife. Montana’s elk herds are over population objective in large parts of the state. But for years, FWP fielded complaints from hunters that wolves had eaten all the elk. Both statements appear to be true.